This list is a compilation of links to sites and resources that will help teach you about photography, from capture to post-processing (image editing) to printing. Most of them offer tutorials, tips and techniques for free. Take better photos with these recommended resources and photography tips. With the introduction of video capture capabilities in digital SLR cameras such as the Nikon D90 and Canon 5D Mark II, it’s time to start talking about video production techniques. 10 Places to Find Photographic Inspiration — A nice list by Scott Bourne. Part 2 (General Equipment Section). Part 3 (Super Telephoto — Experiences with “big glass” 600mm f/4, 500mm f/4, 400mm f/3.5, 300mm f/2.8). Part 4 (Supporting needs: tripods, monopod and heads). National Geographic Photography Tips — Photo tips are laid out by category. Visit Still Life With, a blog on food photography and food styling techniques. Photoshop Tutorial: Give your photo that infrared look. This is one of the most referenced photography web sites, it offers almost everything from basic tips and lessons in terminology (depth of field) to post processing (local contrast enhancement) to advanced techniques (Night Photography). Concepts are extremely well-explained and generously illustrated with relevant images. All about filters — by Thom Hogan. A word about filters, filter sizes and standards — by Yvon Bourque. Iliah Borg advises to use a cyan filter on the lens when shooting tough subjects with a lot of bright red, say poppies (see this photo for an example of blown red areas in the poppies — you can’t see any detail in those areas). Spot the differences between genuine and fake Sandisk CF cards. Click here to read this awesome post by Ian Bramham on the importance of balancing the elements in a composition using the “seesaw” approach. These are highly-recommended books for helping to improve and take your digital photography to the next level. Digital Photography Secrets Free e-course on the basics of great photography. 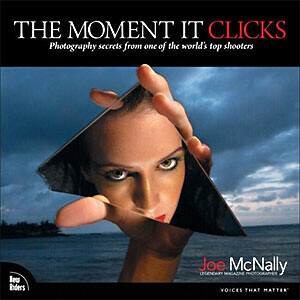 The Moment It Clicks A photography book like no other — Joe McNally enthralls with spades of wisdom and war stories on lighting and the photography process. Understanding Exposure This book by Bryan Peterson consistently tops the list of recommended photography books. Adobe Photoshop for Photographers Martin Evening’s book is almost unanimously agreed to be the best Adobe Photoshop book for photographers. Be sure to get the correct book for your version of Photoshop. Books on Professional Photography A collection of material suitable for the photographer seeking to earn a viable income from a photography business. Inspiring toy photography by Avanaut, photographed mainly with the Canon XTi / 400D.